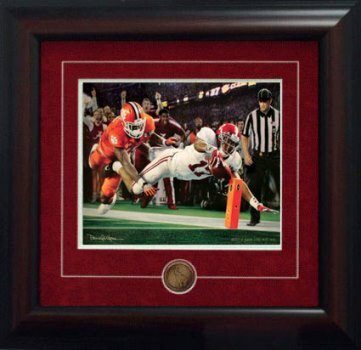 Daniel Moore said about this picture, "I wanted to create a painting of the 2015 CFP Championship Game that expresses that one-word mindset in a single image. Because of what I saw in their faces and the way they played, I could portray any one of many of the great moments for Alabama in the game and it would be adequate for the task. But for me, Kenyan Drake's kickoff return is the one play that represents and encapsulates the spirit, heart, and determination to 'FINISH!'. Each one of the 96 yeards of Kenyan's return was exciting, but none compared to the last, as he nosed the ball just inside the pylon to finish the play for a touchdown".